MIAMI, FL – October 14, 2016 – West Kendall Baptist Hospital was named one of nine winners in the GE HealthyCities Leadership Academy Open Innovation Challenge. This winning project aims to enhance the role of the Healthy Hub, a free, one-stop screening and referral-to-care kiosk. The Healthy Hub project is a collaboration between West Kendall Baptist Hospital, Healthy West Kendall and LifeWallet, a corporate partner. The Hub uses the American Heart Association’s Life’s Simple 7 assessment to generate a health score using biometric information gathered by a nurse. Currently, many of the Hub visitors are at risk for diabetes. This project intervenes with those pre-diabetic patients to improve both their clinical and personal health outcomes. “We are proud to be named a winner in the GE HealthyCities Leadership Academy Open Innovation Challenge and we are excited that this opportunity will further support our commitment to enhancing the health and quality of life of our community,” said Javier Hernandez Lichtl, chief executive officer for West Kendall Baptist Hospital. This collaboration with LifeWallet, and the other key community partners on the Healthy West Kendall Coalition, will continue to support our collective vision to create the Healthiest Community in Florida,” added Hernandez Lichtl. West Kendall Baptist Hospital will receive an initial award of $25,000 in prize money to help develop population health improvements through partnerships with public and private entities, and will be eligible for a final prize award of $250,000 after a year of collaborative learning and support. Additional Healthy West Kendall Coalition partners on the Miami Team include the Florida Department of Health in Miami-Dade, Florida International University, Health Foundation of South Florida and Health Council of South Florida. “It is a great honor to have the Healthy Hub recognized by an esteemed panel of judges and GE. This innovative model of preventative care has demonstrated a positive impact in our community. With GE’s support, we can do a more intensive intervention for people whose blood sugar is above normal range and help reverse the trend and prevent the development of diabetes,” said Theodore Feldman, MD., Medical Director of the Healthy Hub. A part of GE’s healthymagination commitment, the HealthyCities Leadership Academy is a new program to mentor and support leaders in their communities as they develop and support new strategies to tackle population health challenges. The goal of the initiative is for community and business leaders to work together to help the cities, towns and communities where they live and work to address significant health challenges. Winning communities were determined after a thorough evaluation of all eligible entries based on their ability to demonstrate a clear potential to improve the health of all socioeconomic strata of the targeted community. Selections were determined by a panel of distinguished judges who have expertise in the fields of population health, public health, and healthcare. As part of the program, the nine winning communities will participate in a year-long learning collaborative that formally kicked off with a two-day, in-person workshop at GE’s Global Leadership Institute in Crotonville, New York, on October 11-12, 2016. Activities that follow include in-person and virtual training sessions by experts in the field of health and the broader determinants of population health, site visits by many of these experts and GE to provide peer support and mentorship around the winning community program being implemented, and other opportunities to create connections, partnerships and innovations that incubate and scale their ideas. At the conclusion of the program in 2017, the most successful communities will compete for additional funds from a total pool of $250,000. For more information and to read about the challenge process, visit www.healthycitiesleadership.com. 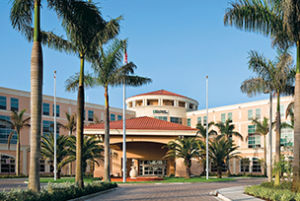 West Kendall Baptist Hospital is part of Baptist Health South Florida, the largest healthcare organization in the region, with seven hospitals (Baptist Hospital, Baptist Children’s Hospital, Doctors Hospital, Homestead Hospital, Mariners Hospital, South Miami Hospital and West Kendall Baptist Hospital), nearly 50 outpatient and urgent care facilities, Baptist Health Medical Group, Baptist Health Quality Network and internationally renowned centers of excellence. The not-for-profit, faith-based Baptist Health has approximately 16,000 employees and 2,300 affiliated physicians. Baptist Health South Florida has been recognized by Fortune as one of the 100 Best Companies to Work For in America and by Ethisphere as one of the World’s Most Ethical Companies. For more information, visit BaptistHealth.net and connect with us on Facebook at facebook.com/BaptistHealthSF and on Twitter and Instagram @BaptistHealthSF. GE’s healthymagination commitment is about better health for more people. We continuously develop and invest in innovations that deliver high-quality, more affordable healthcare to more people around the world. For more information about our healthymagination commitment, visit www.gesustainability.com. Tags: West Kendall Baptist Hospital.